Can you believe it has been a whole year since we played at Audible Assault’s 1-Year Anniversary show?! Man time flies when you’re having fun! Well it turns out Audible Assault liked us there so much last year that we’ve been asked to come back and play again for round 2 and have happily obliged. There will be a huge epic lineup of 10 bands with a special feature performance from host Haze Thy Puppetmaster. The Grill Sergeant BBQ & Catering will be on site serving up delicious BBQ creations. There will even be live art creating brought to you by local artist Nathanael Reveles all night! Keep reading for more details on the Audible Assault Entertainment 2-Year Anniversary Party below. 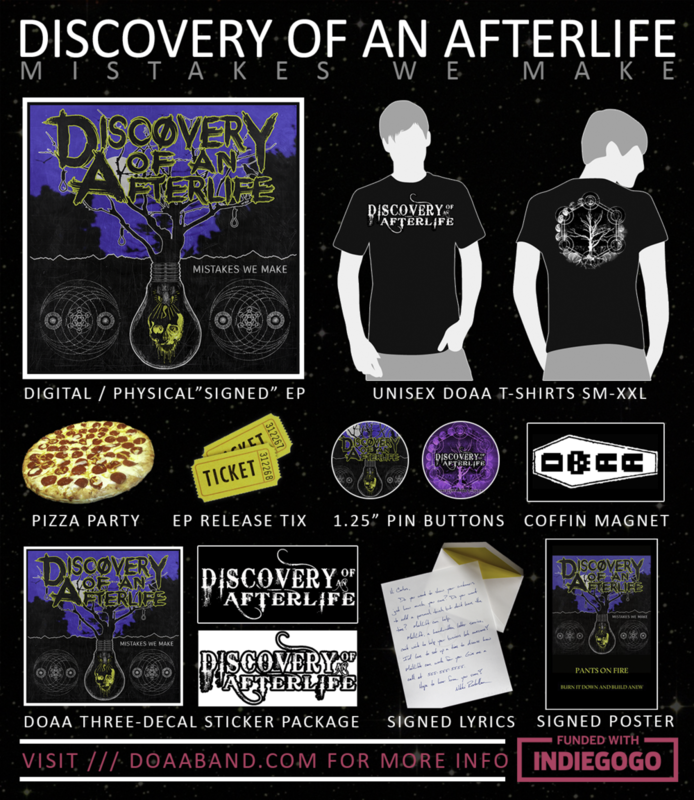 You can get special pre-sale ‘keepsake’ tickets at the price of $10 by contacting us directly at discoveryofanafterlife@gmail.com or through any of the bands above. Tickets will be sold at the door on the day of the event for $15. This is an age 21+ show. Joe’s Grotto is located in a small shopping complex up in northern Phoenix and while we anticipate there being enough parking for everyone, be sure to show up early for the best available parking spots. We have been invited to perform at The Mid-Summer Throwdown and will be returning to Club Red on Saturday August 18, 2018. This is going to be a huge show with over 10 artists performing so be sure not to miss out! For more details keep reading. Special thanks to PosterMyWall.com, Superior Booking, Rip it Energy Fuel, and TicketLeap for making it all happen! Advance tickets are being sold for $10.00 per ticket. You can purchase them online or by contacting us directly. Tickets will be sold for $12.00 at the door on the day of the show. Club Red is located in Mesa and has a vast parking lot to accommodate a big turnout, but as always, show up early for the best parking spots! Soundphoria is putting on a free show Friday the 13th, 2018 at the Starlite Lounge in Glendale, AZ. 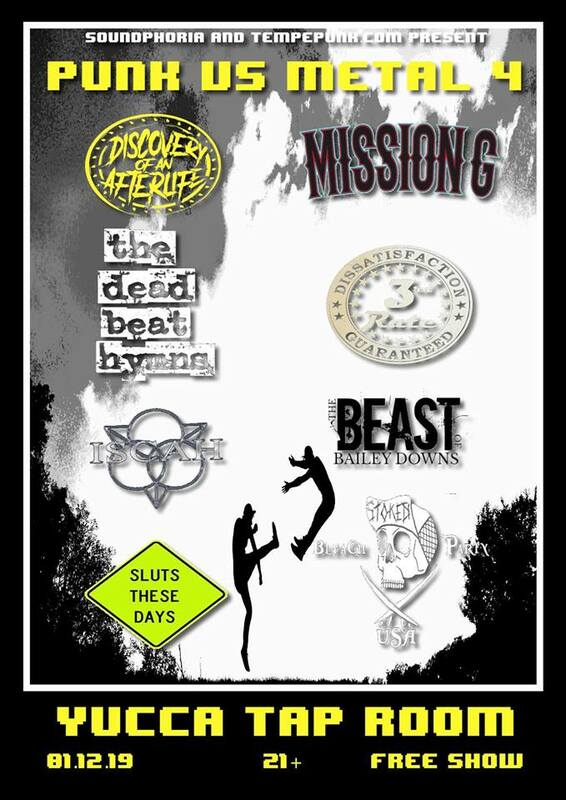 We've been asked to perform alongside Mission G, Sin Shrift, 3 Seconds More, and Malo de Dentro and have happily accepted. Thanks to the sponsors, Lunasigns and The Best Clothing Company, for making this show possible. It's going to be a great night of mischief and superstition so be there or be square! This is a free show for anyone age 21+ so tickets will not be sold. The Starlite Lounge is located in a small shopping center in Glendale. There is usually plenty of parking available but showing up early will give you a better chance of getting a better spot! 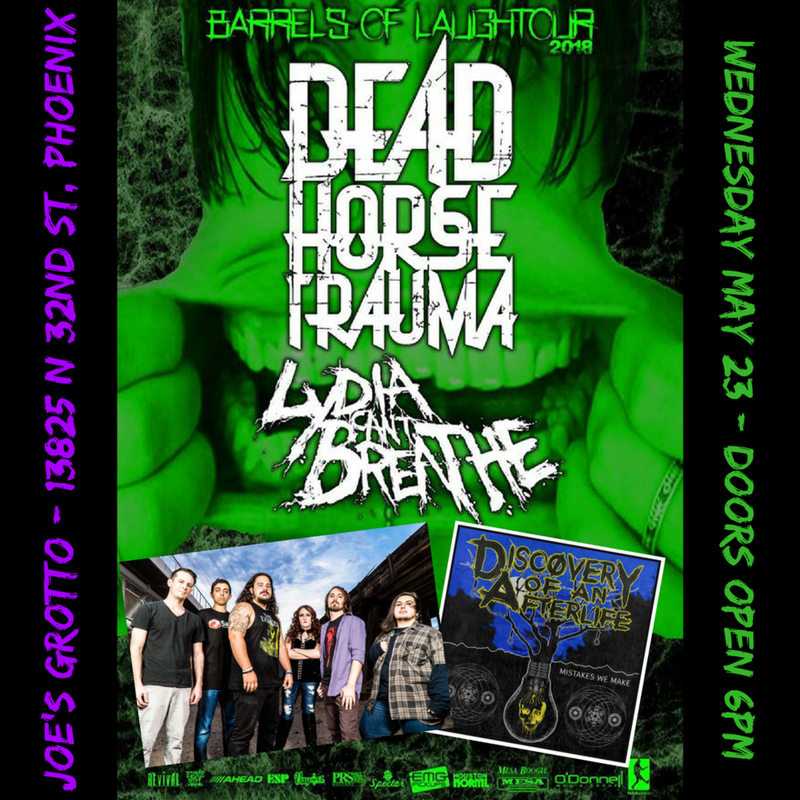 Audible Assault Entertainment has invited us to open for national headlining act Dead Horse Trauma when they come through Phoenix this May on their Barrels of LaughTOUR 2018. We love working with Audible Assault and quickly jumped at the opportunity to open for such awesome acts. Be sure to check out Dead Horse Trauma's latest music video for 'Massacre' which features a ton of awesome live footage of the band. Below you'll find all the details on the other supporting acts and on the show itself which is once again at Joe's Grotto! Be sure to RSVP to the official Facebook Event Page and leave us a comment with what songs you'd like to hear us play. Contact us by emailing discoveryofanafterlife@gmail.com to request tickets at the pre-sale price. Please be sure to let the attendant at the door know that you're there to see Discovery of an Afterlife when you first enter the venue. Joe's Grotto is located in northern Phoenix in a small shopping complex. There is usually plenty of parking but showing up early will ensure you get a good spot! Our friends in Spence are on tour again and asked us to come play a show at The Rebel Lounge in September when they pass through Phoenix. We had a blast playing with these guys for the first time back in April at The Rogue Bar, and we are so stoked that they liked us enough to let us share the stage again! Until the show check out Spence's latest video for 'What Ya Got' and the other awesome bands we'll be playing with that night. Full details below! Be sure to RSVP to the official Facebook Event Page and let us know what songs you want to hear! Feel free to leave requests in the comments below as well. Contact us by emailing discoveryofanafterlife@gmail.com for the best price on tickets, and be sure to let the person at the door know you're there to see Discovery of an Afterlife when you arrive the night of the show. The Rebel Lounge has limited parking at the venue itself, but there is plenty of residential street parking in the nearby neighborhood. Arrive early for the best parking and just be sure to not block anyone's driveway!